If you had told me two years ago that I’d not only read a bit of poetry, but I’d write some, as well, I would have scoffed condescendingly. But take one English poet, add the allure of a French countryside and open an often closed American mind a little, and it’s possible to turn even a jaded and cynical hard news journalist into a believer. 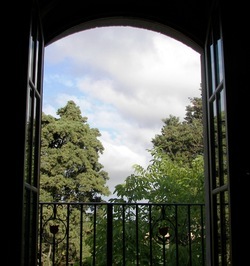 The setting was the French House Party located in the Languedoc region of Southwest France. 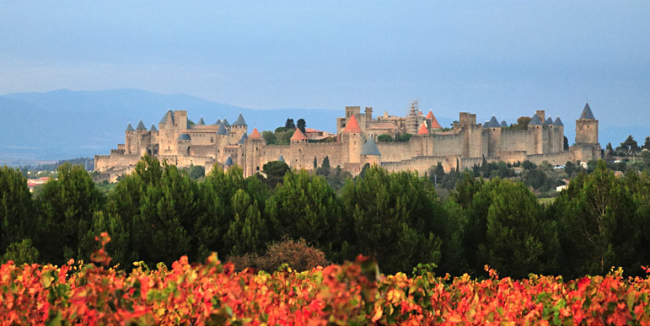 Carcassonne, a 400-year-old medieval World Heritage site, sits nearby, adding to the appeal of the area. The French House Party “Experience” is an all-inclusive creative arts vacation retreat that offers a variety of courses in such topics as painting, movie-making, singing, cooking and creative writing. As a longtime newspaperman, I knew how to write. Stringing sentences together in a coherent and concise manner is easy for me. What’s difficult as a crime reporter – my job in my previous life – is dealing with the horrors of society without letting them affect your psyche. Writing about rapes, robberies and racketeering were staples of my day. That was my life as a crime reporter. Dealing with death and destruction daily for nearly 20 years definitely hardened my view of the world. And I guess I took some of that cynicism with me when I turned my back on that era to write about less grim and solemn subjects. So, just 18 months removed from my life as a newsman, I decided to venture out of my comfort zone, take a trip to Europe and check myself in to a creative writing retreat. I had no idea what to expect. Not only was it my first trip overseas, but it also was my first foray into creative writing. I figured character development, setting, dialogue and other novel-writing topics would be covered. And they were. Instructor Sarah Hymas, an English poet and short-story writer, structured her class to focus on the basics of creative writing. And with her poetry background, she decided to incorporate that form of writing into the class, as well. Come on. Poetry, I thought? What self-respecting news reporter – especially one from the South – would write poetry? Who wants to write about flowers, and rainbows, and trees? My writing had more meaning. Murder made my ears perk up, and my mantra was: “If it bleeds, it leads.” And to make the entire concept even more bizarre, I’d found a kindred spirit half way around the world. Our hostess, Moira Martingale, authored a book in the 1990s called “Cannibal Killers.” The true-crime book focuses on history’s most infamous killers, Ed Gein and Jeffrey Dahmer, to name a couple. Surely, this was no place for poetry. But here I was – a former crime writer for an Eastern North Carolina newspaper – getting ready to write about… What? Hopes and dreams and puppy dog tails. I was raised in the South – the Southern United States – where rednecks and race cars rule. But over the years, I tried to divest myself of those stereotypical ways, ridiculing NASCAR and shying away from hunting. I like history, and reading, and golf – more sophisticated sorts of enjoyment. But I drew the line at poetry. And that’s what they call irony. by J. Eric EckardI should have seen it coming though. The French House Party is pretty upscale, with a swimming pool, tennis courts, a boules court and beautiful views of the French countryside. With two chefs on hand at the renovated 200-year-old farmhouse, the sophistication level was high. Pexiora, a village of less than 1,000 people located between Carcassonne and Toulouse, was a bike ride away. Legend has it that the tree-lined main street is a carry-over for when Napoleon had all main roads lined with trees so his armies could march in the shade. All this was conducive to “fancy” writing. But still, I didn’t see it coming until it was too late. Hymas helped her students “dip their toes in the water” of creative writing. She conducted exercises for narratives, focusing on characters, setting and story-telling. But it was all a trick. Write a short story based on one of these photos, she said, spreading out a variety of pictures on the table. Draw your own picture, and write a story. Write your own fable. I bought into it. Like most writers, I always believed I had that great American novel somewhere inside. But instead of obsessing on my half-finished manuscript about a serial killer, I was duped into absorbing different views and diverse cultures – and gaining a little confidence in myself along the way. The class, which also included a couple from England, a professional origamist, another freelance writer and an American artist living in Italy, followed blindly, thanks in a large part to the ambience and atmosphere of the French House Party. Rick Beech, the English origamist, said it best: “The setting … is ultra conducive to writing.” He also said that he appreciated Hymas for urging all of us to read our work aloud, saying it gave him confidence in his writing. But again, that was a trick. By the time she sprang the poetry assignment on us, it was too late. We had already bonded, sharing our insecurities and vulnerabilities through our oral presentations. What’s a little bad poetry among friends? Kicking and screaming, I tried my hand. He is watching both of us. Instead of being used for love, we’re being used for evil. I have no concept of good or bad poetry. But what I do know is that this “poem,” generated from a free-writing exercise, could be transformed into a short story about spies and torture. So, I guess poetry isn’t just for sissies. J. Eric Eckard has been a journalist since 1990, writing about a wide range of topics including crime, politics, education, business and sports, automotive reviews and travel.